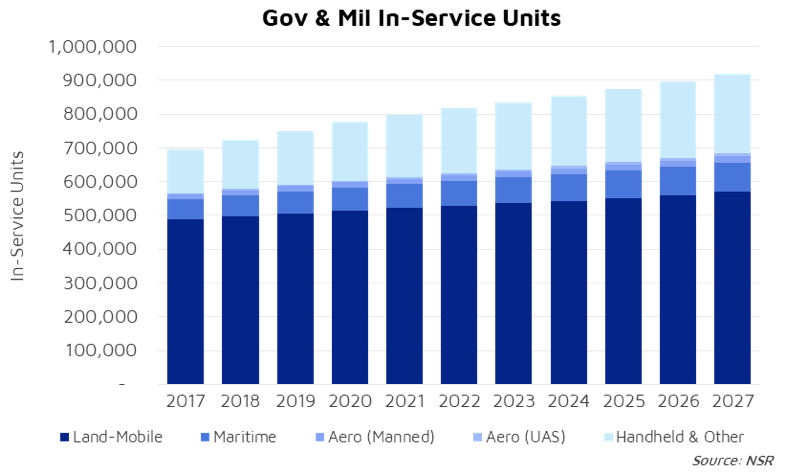 Historically, Government & Military satcom markets have suffered from terminal troubles – too costly for AEHF, delayed for MUOS, a mismatch between terminal and frequency/network capabilities, etc. The list is as extensive as the terminal inventory of the U.S. Government, which is stated to be in the tens of thousands. Quite simply, the terminal trouble is a combination of ‘my box for my network’ with a ‘my box on your network’ wish of Gov & Mil end-users that has yet to be fully realized and for which industry solutions are in sight. According to NSR’s Government and Military Satellite Communications, 15th Edition report, there will be more than 900,000 In-service SATCOM Units by 2027, a net-add of over 200,000 In-Service Units from 2017. Where and what will these In-Service Units add to an already complicated mix of ground infrastructure? Mostly, they’ll add additional flexibility to integrate more end-user platforms (ships, tanks, trucks, troops, etc.) into a common operating picture by enabling higher levels of Command and Control (C2) applications. C2 requirements will drive In-Service unit adoption into the lowest levels of force structures, across all regions, all markets, and all end-users. Already, the U.S. Government has a robust program in the form of Blue Force Tracking, which continues to see capability upgrades to move beyond purely narrowband C2 applications, towards pushing video, images, and other larger data streams. Moreover, just as the saying goes that conflicts are won by the country with the best logistical planners, conflicts of tomorrow require a robust communications infrastructure. These front-line In-Service Units ‘must work’, regardless of the RF environment, end-user platform, rain conditions, cyber-attacks, etc. While the largest number of In-service units, they also represent some of the more complex programs, and a huge opportunity to build value beyond pure-connectivity for Service Providers. Beyond narrowband applications, higher-throughput In-Service Units in FSS and HTS, GEO to LEO, C-band to X-band are all where the ‘action is’. What does that mean? Simply, most of the focus of Gov & Mil planners for commercially-sourced managed services is in enabling Mbps of connectivity across Gov & Mil systems – gathering ISR data from UAS platforms and pushing that into forward-deployed troops using a comms-on-the-pause (COTP) terminal. Or, leveraging multiple data sources and fusing that data together into a large integrated operating picture. Today, that information is as important, if not more important, than any other piece of kit in the toolbox of military planners. Yet, just as with narrowband terminals, those capabilities are increasingly under threat – from low-cost jammers to more of the ‘square-peg, round-hole’ issue of terminal vs. network mismatch. Going forward, commercial industry and Gov & Mil end-users are looking at solving some of those problems through a combination of new terminals and new operating paradigms. Multi-band terminals will enable single apertures to quickly roam between different frequencies. Flexible Modem Interfaces and Software Defined modems should allow better RF/IP interface. Flat Panel Antennas could help solve the multi-orbit operational paradigm without the bulk of traditional tracking parabolic reflectors. Overall, it is not the number of terminals that are the issue – it is the lack of flexibility of those terminals to seamlessly roam between orbits, frequencies, and network architectures. Already, the shift from an RF-focused view towards an IP-focused view is gaining importance when acquiring commercial capabilities. That paradigm shift should not be under-estimated. More than just changing contract language from MHz to Mbps with a CIR and SLA – it is one of the key steps towards putting this terminal trouble in-check. What that means more practically, is enabling better control of end-user networks under a ‘single pane of glass’. Adding commercial best-practices for network management systems that will hopefully allow dynamic access to device-level configuration settings, while still ensuring link availability. It is not a change that will happen overnight, but in the shift away from the current operational paradigm, greater insights into all parts of the network is a natural benefit.